The 80 CFM WhisperSense Panasonic exhaust fan models feature dual sensor technology to detect both humidity and motion. The SmartAction motion sensing technology turns the fan on automatically when the room is occupied. The humidity sensor can be set from 30 seconds all the way to 60 minutes. The sensor detects the relative humidity (RH) levels in the room, and has a built-in timer that turns the fan off after a certain amount of time to save energy. This exhaust fan runs extremely quietly, and meet the industry standards of ENERGY STAR, HVI, LEED for Homes, and ASHRAE. With a .25" w.g. (water gauge) rating, it performs with powerful CFM and quietly while under pressure and post-installation. 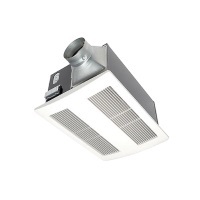 Installation is made easier with detachable 4 or 6 inch adaptors, adjustable mounting brackets (up to 26"), duct ends that are secured tightly, simple wiring, and motor/fan units that can be easily removed from housing. In addition, the double-hangar bar system allows for ideal positioning. Built into the fan is a damper to stop outdoor air from entering the home/building through the fan. Batt or loose fill insulation can be installed over the fan to stop heat from leaving. Mounting Opening (inches sq. ): 17 3/8" x 12 5/8"